Judges will be getting their teeth into pork pies from far and wide for the annual World Pork Pie Championships. The competition was postponed from last month to make way for the wedding of Pork Pie Man Stuart Booth and his bride Joanne. Fresh from honeymoon, Stuart and his brother Kevin Booth are hoping for a bumper turnout of tasty entries this year. People from as far a field as Hartlepool, Leicester and Newark have entered pork pies into the 13th annual competition, which will be held at the Old Bridge Inn, Priest Lane, Ripponden. Organiser Kevin• Booth, from the Pork Pie Appreciation Society, said: “Stuart and Joanne’s pork pie wedding cake attracted a great deal of attention and I am sure they converted lots of people into pork pie lovers. Judging the pies will be last year’s winner and the famous pork pie wedding cake butcher Simon Haigh, co-owner of Hinchliffe’s Farm Shop, Netherton, Huddersfield. He will be joined by the Vicar of Ripponden, Dennis Handley, and other Pork Pie Appreciation Society mem­bers and experts who will be picking their favourite pie. Certificates will be given to all entrants, with rosettes going to those finishing in the top ten and silver cups awarded to the top four. The winner will be given £1,000, which is provided by the sponsor, Timothy Taylor Brewery of Keighley. 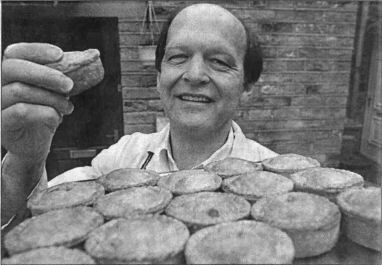 One of those hoping to be crowned Master Pie Maker this year is butcher Steven Heseltine of Southgate, Elland. Entrants will be giving pies to be sold during the day, with all money raised going to Wand Silver Youth Band and St Bartholomew’s Church restoration fund, Ripponden. Judging starts at 2:30pm tomorrow and the winners will be announced about 5pm.